Brains stained against the synaptic protein Brp can be warped onto the standard Aedes aegypti brain using they python code ClearMap. On the left is the reference brain, and on the right are 5 additional brains averaged onto the standard brain. In order to use ClearMap, all images must be acquired with square voxels. The standard brain was imaged with 1um voxel size. To use it as a template, all images must either be taken at this resolution, or down sampled to a final voxel size of 1um. 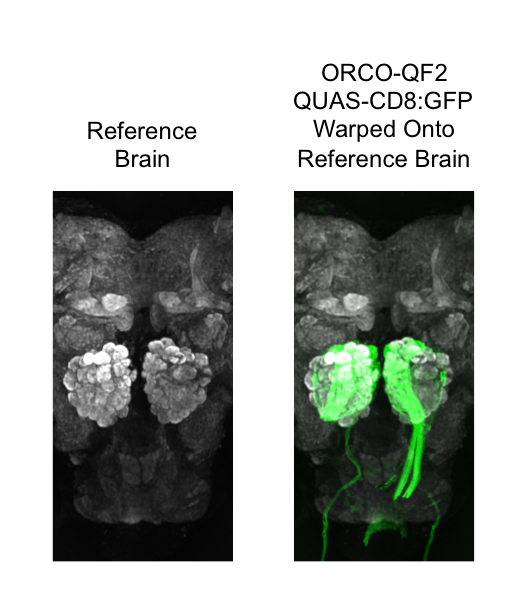 Additional channels can be warped onto the reference brain, as long as one channel is imaged as described above. Below is an example image of a newly generated driver line that expresses CD8:GFP in all ORCO positive cells. The images show the primary chemosensory processing areas of the brain. These images have been registered onto the standard reference brain.